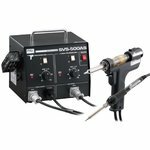 Desoldering stations function as soldering irons and desoldering pumps at the same time. 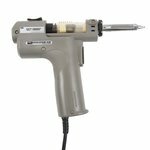 It is an excellent solution, which eliminates the need for using a desoldering pump or wick for solder removal. Handy, portable type desoldering gun with combined temperature control circuit and built-in powerful compact pump. 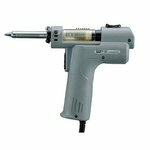 Stable temperature range from 250 – 450 °C. 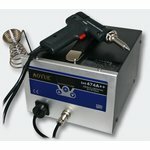 ESD safe powerfull service station combining a desoldering unit and a temperature controlled soldering unit all in one. 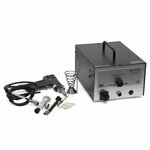 Microprocessor controlled 140 W desoldering station with temperature range from 160 to 480 °C. 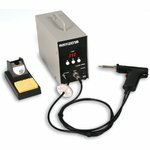 ESD safe desoldering station with an efficient diaphragm pump, soldering iron and separate temperature regulation for easy desoldering work. 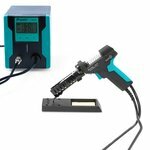 Desoldering station with 90 W heating power, temperature range from 200°C to 450°C. 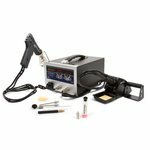 Powerful (70 W) ESD safe desoldering station with an efficient diaphragm pump and separate temperature regulation for easy desoldering work. 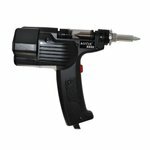 Handy, ESD-safe portable desoldering gun with combined temperature control circuit and built-in powerful compact pump. 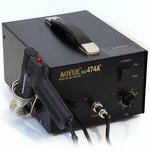 Stable temperature range from 250 – 450 °C. 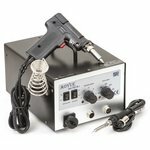 Powerful 150 W and portable desoldering station with 250 °C - 480 °C temperature range.